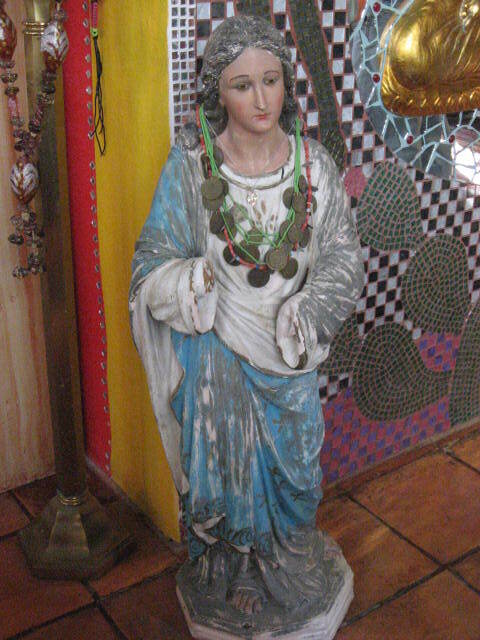 She stands near the kitchen entrance at Casa de Colores, nearly four feet tall. She hold such wisdom and serenity…sadly and reverently bearing our burdens as her own. Rebecca is hosting A Virgin a Day from December 1 – 12, culminating with the Virgin of Guadalupe’s Feast Day on December 12th. Check out everyone’s offerings @ http://corazon.typepad.com/. ~ by Dawn Elliott on December 7, 2011. She is alive isn’t she……love the worn and soft look she has. She speaks to me as well! She is hermosa ! Where is this Casa De Colores? Oh, she lost her hands. This makes her even more special. And I love to see her uncovered head. Even without hands, she exudes great confidence and power! I think we are a lucky bunch that we can hear her speak to us and through us. 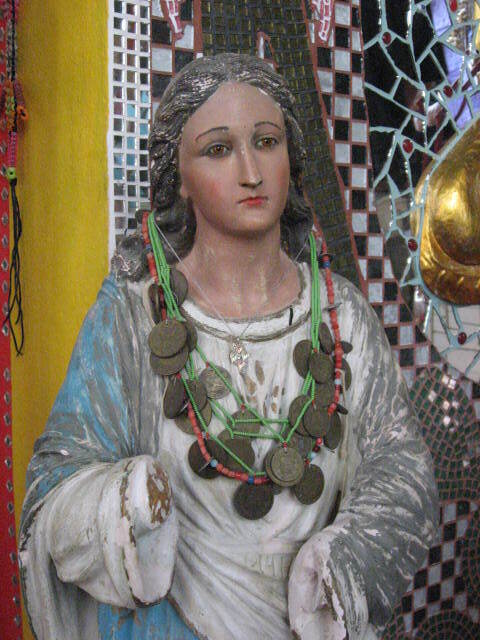 Some of my favorite Madonnas/Marys are ones without hands. What is it about that worn, chippy, patina, worn-out with love look that we/I so love? I just know that I gravitate to the ones that people say “You don’t want that one – it’s broken” I love the look on the faces when I say THAT is the one I MOST want! Ha! Casa de Colores – what a beautiful name – i should like to name my house that – my UK sister in law always names her house in – she is stunning, alive I agree! Casa de Color is in near San Miguel de Allende and was built by an artsy American couple. It is over-the-top awesome! This is marvelous. Wish I had one that tall. I live in Casa Riverbirch. LOL what fun this meme has been. Dawn, you’ve captured a beauty. I always fall in love with Madonnas, and now I have fallen again! i am finally home and completely exhausted. i will walk quietly among each mary offering and drink in all her glory. Long work and volunteer day so I’m late visiting VAD. 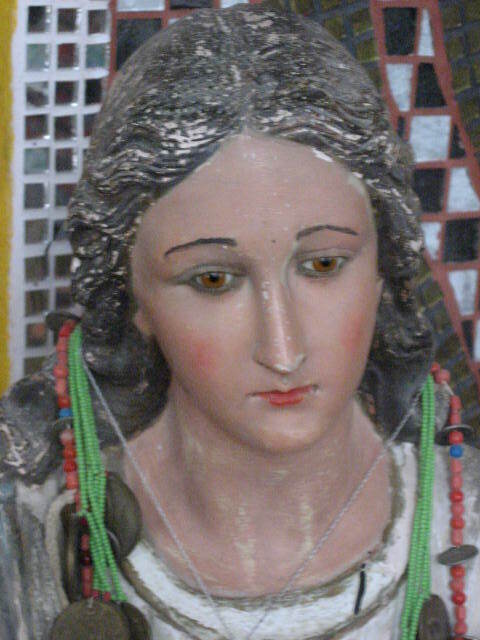 This virgin has the most expressive face and seems to life-like and approachable. Some virgins are pretty formidable. She is soft and lovely. She is lovely and I am very moved by your presentation of her, bringing her in such an intimate way into our circle, letting us know that she is there watching, taking our burdens and loving us always. It’s a beautiful post. She carried a tremendous burden with such great dignity. Love her.